It is a truism of economics and political science that “institutions matter.” Just ask Hillary Clinton about the electoral college, for example. 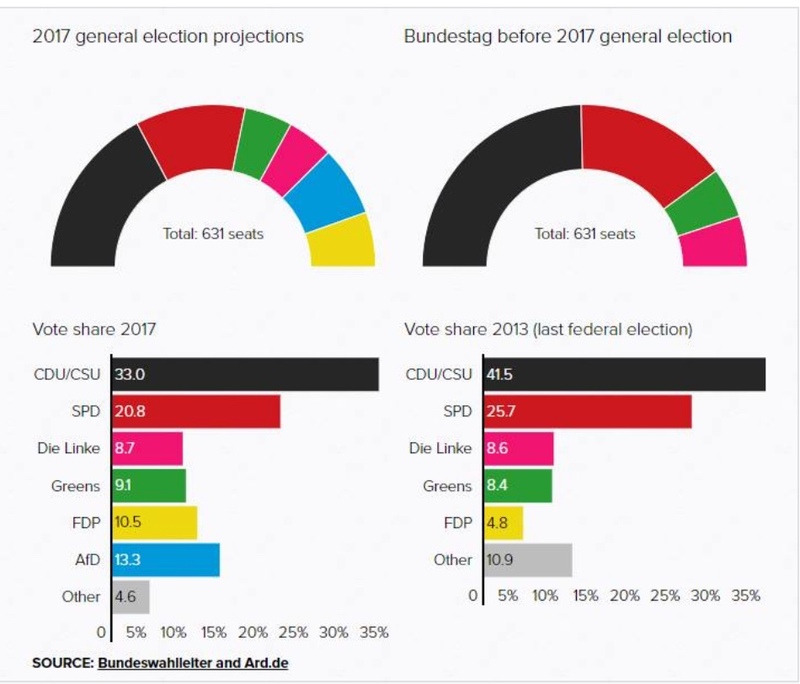 It is interesting that the same people who complain that Trump is president while having won only 46 percent of the popular vote in the U.S. generally have nothing to say about the fact that Merkel’s party only won 33 percent of the vote. Two-thirds of Germans prefer someone else to be chancellor, yet the major media continue to portray Merkel as a colossus bestriding Europe. To the contrary, this result is a sign of the continuing loss of public support for the traditional ruling parties in Europe’s leading democracies (see: France, Brexit, Italy, etc). One wonders what the result might be if Germany used the French system of electing their chief executive separately from the legislature, and there was a runoff election. But one of the most interesting common themes with every expert we met was that Germany would have to keep its nuclear power if it was to stand any chance of meeting its climate goals. In 2008 Merkel was in a coalition with the Green Party, and as such had to accede tot his demand. For some unfathomable reason, after the Fukushima disaster in 2011 Merkel doubled down on ridding Germany of its nukes, even though after her next election she went into coalition with the Social Democrats and left the Greens out of it. As anyone knows who follows this story, Germany’s greenhouse gas emissions have been flat to rising in recent years, and the government as acknowledged it will not come anywhere close to its emission targets for 2020, while its emissions target for 2030 are a joke. It is noteworthy that the Free Democrats, the party of lower taxes and free enterprise, polled well over 20% among voters under the age of 30. That is good news. Young Germans want economic opportunity rather than redistributionism. Merkel polled best among the elderly, particularly elderly women, that is, pensioners. To accommodate the deadbeats of southern Europe, Germany let the European Central Bank push interest rates into negative territory. For retirees living on fixed income, that is economic asphyxiation.